Saturday Night Live newbie Pete Davidson is living the dream. He's only 21, and he's already swiftly rising through the ranks of the comedy world. Dude seems to joke quite a lot about his background: his late father, his mom, his home town, his perceived racial ambiguity. 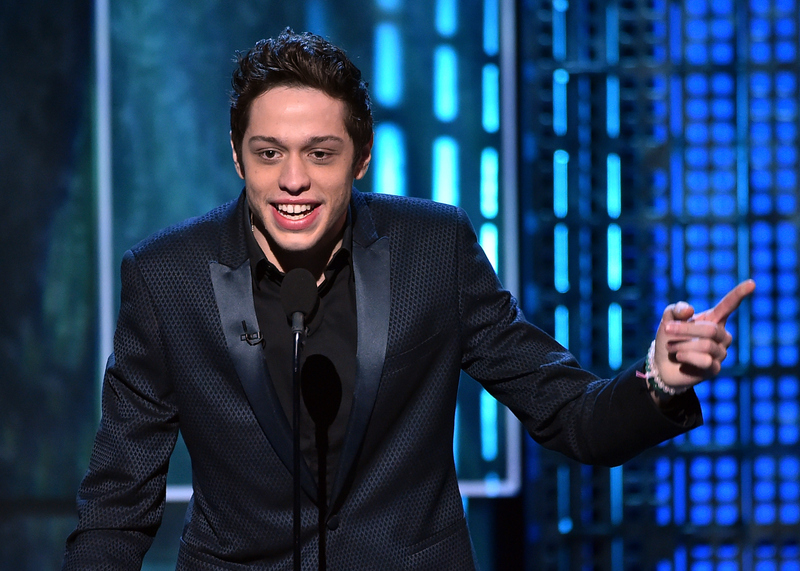 This may have you wondering: what is Pete Davidson's background? Where did he grow up? What did his parents do? Where did he go to high school? You might have been able to tell from his accent that he's a New Yorker — a Staten Islander to be specific. Davidson was born on Nov. 16, 1993 to Amy Waters Davidson and the late Scott Michael Davidson, who was a New York City firefighter. Davidson has a little sister named Casey, who is currently a high school senior. According to SI Live, Davidson attended St. Joseph High School, a Catholic all boy's school. He attended St. Francis College in Brooklyn Heights for a short time, but dropped out. So many schools named after Saints! As he mentioned during his Justin Bieber roast set, his father died in the line of duty at the World Trade Center on September 11. According to his father's obituary in SI Live, Pete Davidson was about to turn eight years old when it happened. Now, he incorporates it into his act. Laughter is the best medicine, as they say. He also made a dirty joke about his mom in a segment of SNL that some viewed as controversial. Don't worry though. He loves his mom, and she totally thought the joke was funny. As many people have done before him, Davidson pokes plenty of fun at his home town. In the following set, he talks about his ambivalence growing up in the forgotten borough. "It's where dreams go to die," he says. Another one of Davidson's favorite topics is his perceived racial ambiguity. In his words, he's all "miscellaneous in the face." Just in case you were wondering about that supposed face miscellany, it looks like the website Ethnicelebs has broken Davidson's ancestry down pretty thoroughly. According to them, Davidson is reportedly Ashkenazi Jewish, Irish, German, Scottish, English and 1/16th Sicilian. The more you know!